button. These Activations have been marked as Reconciled. This was achieved by clicking the commit button on the Matched and Cellular Matched buttons. Only Activations marked with a Reconcile checkmark will have moved to the Reconciled button. If the need arises in the future, you may un-reconciled an Activation within the Manual Reconciliation process. 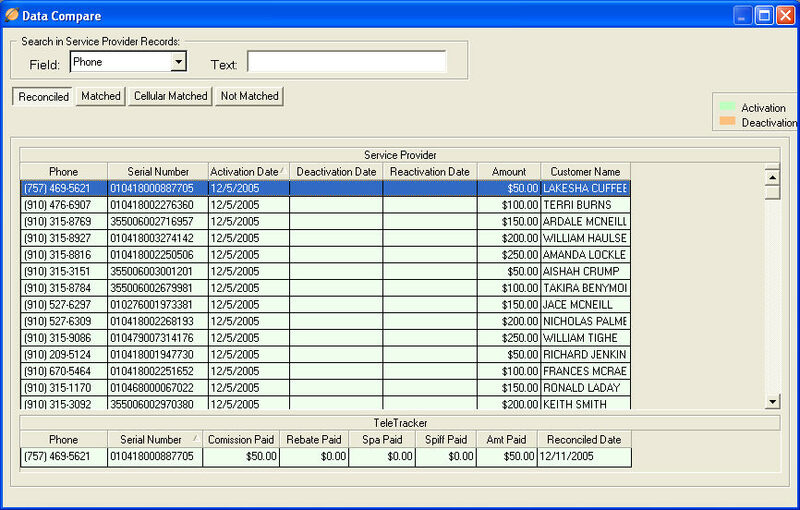 Highlight a specific Activation Record in the top window pane, and detailed TeleTracker Online Activation Information will be presented to you in the lower window pane. Once all appropriate Activations have been committed, and the Activations within the Reconciled button have been verified, close the Data Compare Window.